Diageo has partnered with Selfridges to relaunch a limited edition Summer Colada variant of its ultra-premium vodka Cîroc in the UK. Credit: Diageo. Global alcoholic beverages company Diageo has partnered with Selfridges to relaunch a limited edition Summer Colada variant of its ultra-premium vodka Cîroc in the UK. The expression was an ‘overwhelming success’ when it was first launched in April 2017 as the brand’s first limited-edition expression. Cîroc’s Summer Colada product is inspired by Piña Colada and contains natural pineapple and coconut flavours; the dominant aroma is pineapple with a touch of coconut cream. It is made with vodka created from French grapes distilled five times and is packaged in a white bottle with gold-coloured writing. The product is part of the brand’s 2018 summer collection, which also includes peach and pineapple flavours. Head of Diageo Reserve Great Britain Nick Temperley said: “Cîroc is the UK’s leading ultra-premium vodka and is performing exceptionally well in both the on and off-trades, outperforming the category, up 30.4% in volume and 37.7% in value. 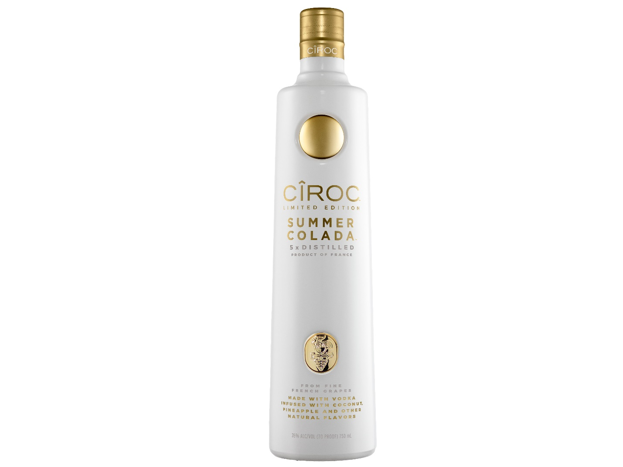 Cîroc Summer Colada was relaunched in the US earlier in April in collaboration with Combs enterprises, owned by musician Sean ‘Diddy’ Combs, which includes a portfolio of premium spirits and wine businesses. Combs said: “This summer we’re bringing back Summer Colada, one of our most successful limited edition variants. Cîroc vodka was created in 2003 by Jean-Sébastien Robicquet, Master Distiller of Maison Villevert, which produces gin, such as G’vine Floraison and 1495 Gin, and cognac. The five-time distilled vodka comes in a range of flavours including plain, mango, amaretto, French vanilla and red berry.